This week, Israeli occupying forces continued their offensive on Rafah town and refugee camp. On Wednesday evening, 19 May 2004, they expanded their incursions into the town to include al-Salam and al-Brazil neighborhoods, adjacent to the Egyptian border south of the town. The Israeli offensive on the town had started on 17 May 2004, when Israeli troops moved into Tal al-Sultan neighborhood in the west of the town, which had been isolated from other areas in the Gaza Strip. Israeli troops withdrew from the town after having killed 41 Palestinians, injured 100 others, demolished dozens of houses and civilians properties and largely destroyed the civilian infrastructure. This report will cover the incidents that took place in Rafah between Thursday, 20 May 2004, and Tuesday, 25 May 2004, when Israeli troops finally withdrew from the town. According to investigations conducted by PCHR, at approximately 22:30 on Wednesday, 19 May 2004, Israeli occupying forces, reinforced by helicopters, moved into al-Salam and al-Brazil neighborhoods in the south of Rafah. Under the cover of intense shelling, they raided and searched a number of Palestinian houses. 2. Wa'el Mohammed Abu Jazar, 18. 3. Hamed Yassin Bahloul, 18. Israeli occupying forces initiated a wide campaign of house demolitions without allowing residents of the homes to vacate any of their belongings. Walls of one of the houses collapsed over its residents injuring a woman and a child. Due to the intense Israeli shelling against the area, 3-year-old Tamer Younis al-'Arja died from a heart attack induced by extreme fear. At approximately 10:30 on the same day, as Israeli bulldozers started to demolish Ziad Hassan's house in al-Brazil neighborhood, he exited his home holding a white flag asking Israeli troops to allow him and his family to leave the house. Israeli troops agreed, but when he and his family got out of the house, Israeli troops fired at them. Hassan's wife and 3 children were injured. An ambulance of the Palestinian Ministry of Health came to the area to evacuate the injured. A number of Israeli tanks surrounded the ambulance and put sand and ruins of destroyed house over it. The driver and two paramedics remained in the ambulance until 14:45, when Israeli forces finally allowed the ambulance to leave the area without evacuating any of the injured. At approximately 11:00, an Israeli sniper positioned in the roof of a house seized by Israeli troops in Tal al-Sultan neighborhood fired at Jamal 'Awad al-'Assar, 39, who was in his house's balcony asking his neighbors for drinking water. He was instantly killed by a live bullet in the head. As a result of the Israeli shelling on Thursday, 5 Palestinian civilians were injured. One of them, Mohammed Ibrahim Jaber, 27, died from his injury by a live bullet to the pelvis. On Friday morning, 21 May 2004, Israeli occupying forces were redeployed around Tal al-Sultan neighborhood. They withdrew from the neighborhood, but then surrounded it. A number of Israeli soldiers positioned atop of a number of buildings at the entrances to the neighborhood and fired at passing Palestinian civilians. Ya'qoub Ishaq 'Othman, 56, was wounded by a live bullet in the left foot. At approximately 11:00, Israeli occupying forces began to raze large areas of Palestinian agricultural land between Tal al-Sultan neighborhood and Zo'rob square. These actions continued until Saturday evening, during which Israeli military bulldozers razed 298 donums of agricultural land belonging to the families of Dahliz, Zo'rob, Buraika, Fouju, Abu Zuhri, Hijazi and Abu 'Oqla, and also destroyed an animal farm. They also partially demolished a house, in which 117 people (2 families) live. During their incursion into Tal al-Sultan neighborhood, Israeli occupying forces largely destroyed the civilian infrastructure of the neighborhood. They also demolished 10 houses completely and severely damaged 117 others, rendering them uninhabitable. According to PCHR's investigations, 1917 people (308 families) live in these houses. Israeli troops also destroyed 11 shops and 11 civilian cars and severely damaged a number of schools, a mosque, a clinic and a public service association. According to eyewitnesses, during house raids, Israeli troops stole large amounts of money, some jewels and some electric sets. They also terrified children. Israeli troops withdrew completely from the neighborhood on Monday morning, 24 May 2004. In al-Salam and al-Brazil neighborhoods, Israeli troops moved back towards the Egyptian border, but did not completely withdraw. They continued to fire at the two neighborhoods, injuring 5 Palestinian civilians, including 2 children. At approximately 01:30 on Saturday, 22 May 2004, Israeli troops, which were still in al-Salam and al-Brazil neighborhoods opened fire at the two neighborhoods and neighboring residential areas. A Palestinian woman, Tahreer Mohammed al-'Ennabi, 19, was wounded by a heavy caliber bullet in the abdomen, when she was in her kitchen, approximately 700 meters away from the source of fire. At approximately 10:30, while Peter Hansen, UNRWA Commissioner General was visiting al-Salam and al-Brazil neighborhood to check the destruction incurred to the two areas, Israeli troops opened fire at the two areas. Rawan Mohammed Abu Zaid, 3, was killed by 2 live bullets in the head and the neck, when she was near her house in al-Brazil neighborhood. On Saturday afternoon, more Israeli military reinforcements were brought to Salah al-Din Street, which links between Rafah and other areas in the Gaza Strip, which had been closed since 17 May 2004. In his testimony to PCHR, 'Arafat Mansour Abu Halawa said that Israeli troops raided his house, forced his family out and transformed the house into a military site. Israeli troops also destroyed electricity towers and water networks in the area. Israeli troops also razed 311 donums of Palestinian agricultural land along Salah al-Din Street. They also demolished 4 houses completely and 5 others partially, in which 79 people (11 families) lived. In addition, they damaged the street and the building of Um al-Nasser local council and destroyed a civilian car. They reopened Salah al-Din Street on Monday morning, 24 May 2004. During their withdrawal from the area, Israeli troops razed 120 donums of agricultural land and demolished an under-construction house in the southeast of Rafah. On Monday morning, Israeli troops moved into Qeshta and al-Sha'er neighborhoods, adjacent to the Egyptian border. Until the evening, they destroyed 5 houses completely and 10 others partially, leaving 224 people homeless. Two Palestinian civilians were also injured by the Israeli gunfire. On Monday evening, 24 May 2004, Israeli troops withdrew from al-Brazil and al-Salam neighborhoods completely, leaving large destruction in the two areas. During this offensive, Israeli troops demolished 122 houses (in which 1468 people lived) completely and 98 others (in which 1425 people live) partially, and largely destroyed the civilian infrastructure. 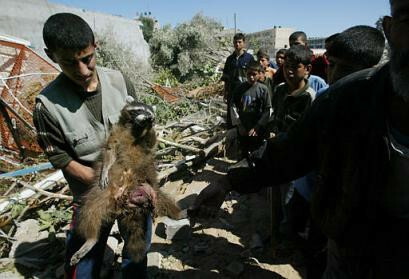 Israeli troops also destroyed a zoo, 3 factories, 6 shops, 4 civilian cars, the fence of a cemetery and a playground. On Thursday, 13 May 2004, Israeli occupying forces initiated a wide scale offensive on Rafah town and refugee camp, during which they committed a series of serious violations of human rights. At the time of issuing this report, 45 Palestinians, 38 of them civilians, including 9 children, have been killed, and 134 civilians, including around 50 children, have been injured. Most of these civilian injuries have been described by medical sources as serious. Israeli troops also destroyed dozens of Palestinian houses, rendering hundreds of Palestinians homeless. They also largely destroyed the civilian infrastructure and civilian facilities in the town and refugee camp. On Thursday morning, 13 May 2004, Israeli occupying forces moved into Rafah refugee camp, adjacent to the Egyptian border. Israeli forces withdrew from the camp on Saturday morning, 15 May 2004, leaving 14 Palestinian civilians dead, including 2 children, 48 others injured while causing massive destruction across the area. Eleven of the victims were killed by shrapnel from missiles launched by Israeli helicopter gunships. This Israeli military escalation followed the destruction of an Israeli military vehicle near Salah al-Din Gate on the Egyptian border, south of Rafah, which left 5 Israeli soldiers dead. On 17 May 2004, Israeli occupying forces launched a full scale military offensive on the town in the context of a military operation known as "Operation Rainbow." Until the time of issuing this report, 31 Palestinians, 31 of them civilians, including 7 children, were killed. At least 100 others, many of them children, have been wounded, many of whom are still in serious condition. According to statements by Israeli political and military officials, this operation will continue for several days, which imposes serious threats to the lives of Palestinian civilians. Palestinian medical personnel have been denied access to the wounded. Residents of the town and refugee camp have been suffering from harsh living conditions as they lack basic services, including electricity and water. Six other civilians were injured, 2 of whom are still in serious condition. 4. Mahmoud Jamal al-Siksik, 18. Eight other civilians were injured. 7 of them are in serious condition, according to medical sources. More Israeli military reinforcements were then brought to the border. When Israeli military vehicles moved close to al-Brazil neighborhood, they opened fire at the areas. A 12th Palestinian civilian, Ahmed Mohammed al-Yaqoubi, 19, was killed by a live bullet in the back, when he was near his house. Israeli forces continued to shell the area until midnight, injuring 6 Palestinian civilians at their homes. On Friday morning, 14 May 2004, Israeli forces expanded their incursion to include Qeshta and al-Sha'er neighborhoods, and continued to shell Palestinian residential areas in Rafah. At approximately 06:00, Ashraf Hassan Qeshta, 37, was wounded by a several live bullets in the head and the chest, when he was inside his house, adjacent to the Egyptian border. As a result, he bled to death. His body was found when Israeli forces withdrew from the area. In addition, 13 Palestinian civilians were injured by the Israeli shelling. Five of the wounded were in serious condition. One of wounded, Akram 'Abdul Karim Abu al-Naja, 27, died from his injury by a live bullet in the chest. In this incursion, Israeli forces destroyed 99 homes, including 72 houses completely destroyed and 27 houses partially in Rafah. As a result, 1308 people (221 families) have become homeless. These people join the hundreds of other families in the same area, whose houses have already been demolished. Israeli troops also destroyed 23 shops, a mosque and bank. (Note: PCHR has details of these houses). According to initial information available to PCHR regarding the second operation, on Monday morning, 17 May 2004, Israeli forces closed Salah al-Din Street, which links Rafah to other areas in the Gaza Strip. They razed large areas of Palestinian agricultural land in the north of Rafah. Israeli troops denied access to vehicles of the ICRC into the town. This prevented humanitarian assistance being provided to its residents. 3. Mohammed 'Abdul Rahman al-Nawajha, 31. In addition, 5 civilians were wounded, one of whom is in a critical condition. A number of houses were also damaged. Israeli troops prevented an ambulance from transferring one of the wounded to Gaza European Hospital. 5. Ahmed Jasser al-Sha'er, 18. 3. Mahmoud Isma'il Abu Touq, 34, hit by 2 live bullets in the chest and the abdomen. 7. 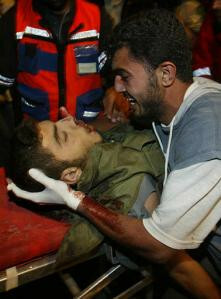 Tayseer Zaki Kalloub, 31, hit by a live bullet in the abdomen. These victims were killed while they were inside their houses. Their bodies remained in the houses until the evening, as Israeli forces denied ambulances access to the area. In addition, 16 other civilians were wounded. A number of the wounded remained bleeding inside houses for several hours. Due to the siege imposed on Rafah and the minimum capacity of Abu Yousef al-Najjar Hospital in Rafah, its administration was forced to put bodies of the victims in a vegetable fridge and neighboring shops. Israeli troops fired at ambulances to obstruct the evacuation of the wounded to the hospital. Medical personnel of 4 ambulances were forced to get out of them and escape as they were fired at. Electricity and water supplies have been cut from the neighborhood. There are also reports of arrests in the neighborhood, as Israeli troops raided a number of houses. A number of civilian properties were also destroyed. 4. Ussama 'Abdullah Abu Nasser, 27, hit by a live bullet in the chest. Palestinian civilians were subject to degrading treatment and beating by Israeli troops. They were taken to nearby Israeli settlements and military locations, where they were interrogated until the evening. Then, they were all released, with the exception of 3 civilians. Israeli troops also raided and searched a number of houses and arrested 2 Palestinians. A number of houses were also damaged by the Israeli shelling. In an unprecedented attack, an Israeli helicopter gunship fired a missile into a civilian demonstration in Rafah town, killing and injuring dozens of Palestinian civilians, including children. According to PCHR’s preliminary investigations, on Wednesday afternoon, 19 May 2004, a civil demonstration was organized by the residents of Rafah town and refugee camp. Thousands of residents gathered to march in protest against the ongoing Israeli military offensive conducted in the Tel As-Sultan area of the town since Monday. The march was heading towards the Tel As-Sultan area at around 14:10 during the afternoon. When the first of the marchers were approximately 500 metres from the entrance to the Tel As-Sultan area, an IAF helicopter gunship fired a missile into the crowd of marchers. Eye-witnesses also reported that Israeli forces stationed at the nearby Israeli military post at Tal Zo’ruo fired tank shells and opened fire from machine guns at the marchers at the same time as the missile strike. 8. Rajab Nemer Barhoum, 18. In total this week, at least 105 Palestinian houses have been destroyed in Rafah, rendering 1464 civilians (245 families) homeless. In addition, 23 shops and some civilian properties were destroyed. The Israeli military operation is still ongoing. More Israeli military reinforcements were brought to the area. On Wednesday evening, 19 May 2004, Israeli forces expanded their offensive on Rafah as they moved into al-Salam and al-Brazil neighborhood. The town is suffering from a shortage of foodstuffs, basic sanitation and electrical services.